“Few days ago, we have hanged a banner in the old part of Lublin. The banner is a stance of solidarity with anarchists being accused of an arson attempt against the police cars, who will stand in front of the court may the 31st. We have chosen the place between the old town and the castle, where loads of people are passing everyday, so the message could reach their maximum number. We feel that it is extreemly important that the repressed anarchists feel supported by their milieu. Posters, banners, graffiti – there is loads of ways to show them that they are not alone. We encourage other groups and individuals to similar acts. On the Banner: Freedom to three Anarchists from Warsaw – tortured by the cops. For the world without prisons, nationalist bastards! Insurrection, Anarchy, Resistance! 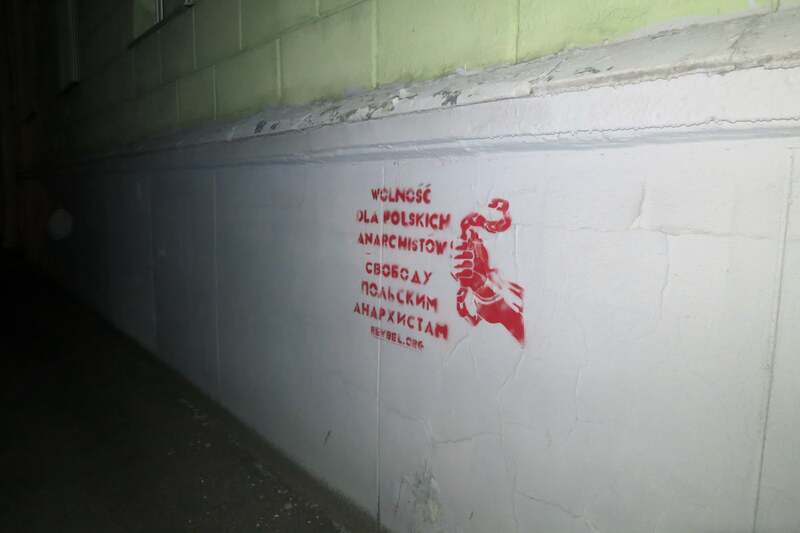 Łódź: The night before the first court case of the three anarchists in Warsaw accused of attempt of arson against cop carsattempt, a solidarity banner appeared in the center of Łódź. On 31st May minsk anachist group performed solidarity action with polish comrades. 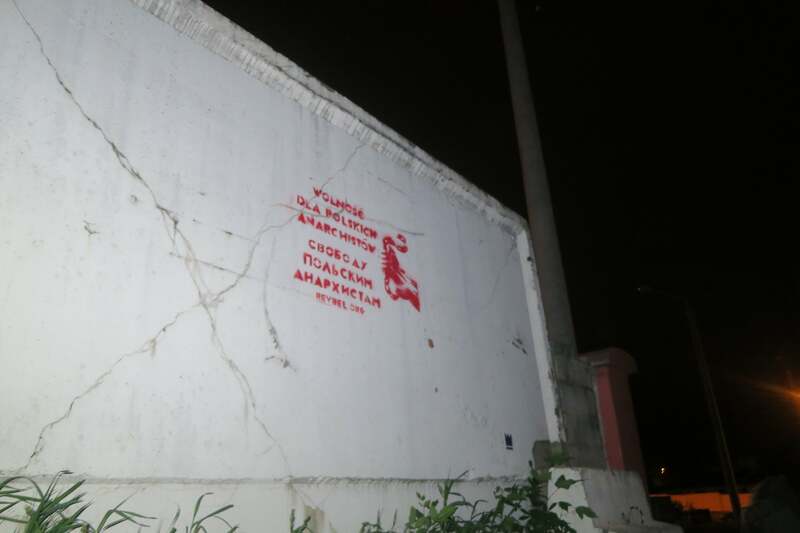 Stencils with sign “Free polish anarchists” in russian and polish languages was drawn near Poland embassy on Zmitroka Byaduki, 11 street. 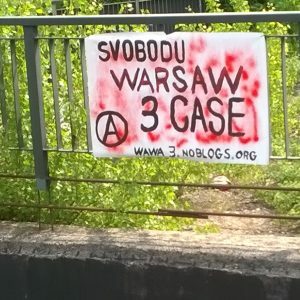 In Poland started a court case of “Warsaw 3” on 31st May – three polish anarchists have been arrested and charged in keeping explosives and in an attempt to burn down a police car. Government media introduce them as terrorist and on the first hearings of the accused there were visible marks of tortures on activists bodies. This case is only one of the episodes of repression of anarchist movement under the pretense of counterterrorism in Poland. The polish state has imprisoned comrades, but it wasn’t enough, they still risk to go in jail. It doesn’t matter how “democratic” or authoritarian state, when it feels a threat from people who want freedom, it always reveals its repressive nature. Solidarity banners appeared in Prag. The Voice of Arachopacifism website informed about solidarity demo in Warsaw. 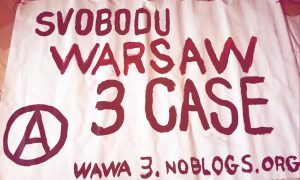 Banner reads: Freedom for Warsaw 3 case!. This entry was posted in General and tagged banner, solidarity actions, trial, wawa3. Bookmark the permalink.